You might (or might not) know by now that I’m a HUGE cephalopod fan. And because I’m a human being–and apparently it’s in our ridiculously flawed nature–since I admire them so much that somehow translates into a desire to own one. Luckily my more practical self realizes that would be a terrible awful very bad idea. So instead I admire them from afar watching videos and reading books about them. And I’ve made myself “contractually obligated” to share any worthwhile cephalopod-related ephemera I stumble upon here on SB-P. 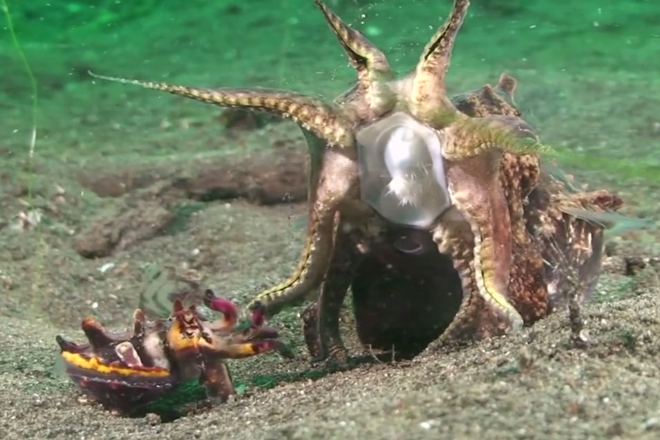 These videos spotlighting the flamboyant cuttlefish qualify as worthy. And yes, that really is this fabulous creature’s name. Trust me when I tell you it has earned it. Flamboyants live in the tropical waters off of southern New Guinea, northern Australia, and the islands of Malaysia, the Philippines, and Indonesia. Like most cephalopod, cuttlefish don’t spend too much time here before they shuffle off this mortal coil. But oh boy does this creature make an impression during it’s short stay. This brilliant master of camouflage can switch so effortlessly between colors, textures and patterns that it would make any artist weak in knees. And they use their unique ability to both blend in and, when necessary, shock and confuse–broadcasting a dizzying array of brilliant colors and patterns. Is there anything better than a teeny tiny cephalopod? Next Post HELP! I’ve been hopelessly hypnotized by dancing cows…AGAIN!